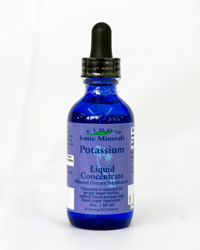 Potassium is one of seven macro minerals--inorganic nutrients needed in relatively high daily amounts. Along with chloride, sodium, magnesium and calcium, potassium is an essential electrolyte. They are called electrolytes because they carry an electrical charge when dissolved in body fluids. These elements are distributed throughout the body's fluids, including blood, lymph, and inter-cellular fluids. Electrolytes help regulate nerve transmission and many cell membrane functions. Magnesium helps maintain the potassium in the cells; but even more crucial is the proper sodium to potassium balance. Without potassium, cell growth can be retarded. Potassium works with sodium to regulate blood pressure and transmit nerve impulses. Along with magnesium, it is essential to the proper functioning of the heart muscle. In this role, potassium acts as the catalyst stimulating cellular contraction. Low potassium intake encourages sodium retention, which raises blood pressure. Additionally, Potassium balances the acid/alkaline system, transmits electrical signals between nerves and cells, aids in the regulation of the body's water balance and is essential for efficient muscle contraction. A deficiency may cause severe dehydration. Potassium functions to maintain the normal acid-base (pH) balance in the blood and tissues. Hypertension is often a result of low potassium levels in comparison to sodium. The body should normally contain more potassium than sodium, but the standard American diet, with its reliance on fast foods, packaged convenience foods, chips, and salt is too high in sodium and chloride and too low in potassium. Research has found that a high sodium diet with low potassium intake tends to elevate blood pressure. This usually leads to a doctor's prescription of diuretics which can cause even more potassium loss, further aggravating the underlying problems. This mineral is absolutely essential in proper amounts for good health. Symptoms of Deficiency A deficiency of potassium (hypokalemia) can occur in people with chronic disease or as a result of the aging process. The most common problems associated with reduced potassium levels are hypertension, congestive heart failure, cardiac arrhythmias, depression, and fatigue. A variety of conditions can cause the loss of potassium from the body. The most common of these conditions are vomiting, diarrhea, and other gastrointestinal problems. Kidney disease (such as acute renal failure) and diabetes, depending on the stage of either, can also cause fluctuations in the levels of potassium. Additionally, many medications can cause depletion of potassium. Examples include diuretics, cortisone, prolonged use of aspirin, and laxatives. The most common symptom of potassium depletion is fatigue. Other symptoms of potassium deficiency include slow reflexes, muscle weakness, acne, and dry skin. A quick loss of potassium could lead to cardiac arrhythmias.